Check to make sure the game you want to add does not already exist on the site. Fill in the name of the game (without spaces between the words!) in the area next to the "Create New Game Page" button. For example: Cannon Fodder would be cannonfodder. Click on the "Create New Game Page" button to create the page. Enter the title of the page like the example below. Thumbnail of the box shot of the game should be 120x150 in size. Screenshots should not be resized in any way and be kept at the original resolution. Do not add illegal links i.e. links to games or cracks of those games when they're still being sold. The [!— … -] tags explain what should be put where. Keep the data you add organised and pleasant to read. Check all links you add to make sure they work. Make sure you don't remove anything that shouldn't be removed while editing. Fill out the "short description of changes" box when you're done editing. Add tags to the game page - check below in the tutorial to see which tags should be present. These are important to the internal workings of the site! Some games have different names. The name to pick should be the official most-commonly-used English name. All images should be clean and devoid of any watermarks or tags. Use only GIF, PNG or JPG files with low compression. Do not link to images on other sites but upload these to the game page instead. You won't be able to add images and screenshots until after you've saved the page at least once. Only then, you'll be able to upload images to that page and link to them. A DOS game was usually 320x200 or 320x240 - just about big enough to see on screen without resizing it. The Gameboy, however, had a much lower resolution of 160x144 which is barely visible on a screen so you're allowed to make that a 320x288 screenshot by resizing it 200%. 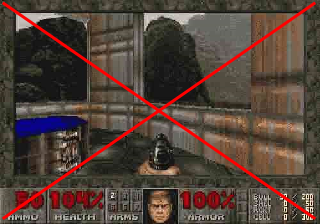 Only resize without using any filter or you'll lose the sharp edges of the pixels. Do NOT upload screenshots that have been altered in any way. They have to be authentic and show the entire screen. Do not upload screenshots larger than 1280x1024. Resize them if you have to! Give your screenshots proper names. 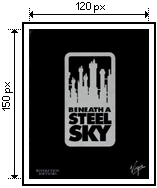 For example: "amiga-beneathasteelsky-ss-01.png". Only upload files smaller than 5MB unless you ask for permission first. any other files that are still protected (i.e. could get us into trouble by being uploaded). Properly name your files. Do not name a song "song1.mp3" but "LittleBigAdventure-theme.mp3" for example. Do NOT add passwords to archives even if you provide the password. If you upload archives, only use ZIP files. As wonderful as RAR files are, a lot of people don't know how to extract them. Make sure to try out every link you add to make sure it works. If that site links to yet another site where the files are hosted - for example Rapidshare or Mediafire. Do not add download links to games that are still being sold. When in doubt, contact a staff member. Do not link to sites that have questionable content. For example, a site that illegally hosts modern games. If the download link on a linked page is hard to find, you can (and should) add a short remark on where to look for it. Make sure you don't remove anything that shouldn't be removed while editing. If you accidentally break or remove something and can't fix it yourself, contact a staff member to fix it for you. When mentioning another game no matter where on a game's page, make sure to link to its game page even if that page doesn't exist yet. 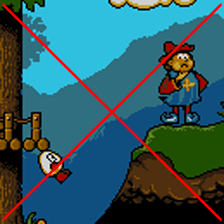 For example, if you state on the page of Lemmings that Lemmings 2 is a lot better, turn it into a link: "Lemmings 2 does a lot of things better than Lemmings"
Do not copy and paste data from other sites, not even Wikipedia. Instead, rephrase the info. For example Wikipedia states: "With all the ports included, it has been estimated that over 15 million copies of Lemmings have been sold since 1991.". Simply rephrase that into something like: "Since its release, Lemmings has sold over 15 million copies if you include the sales of all ports." Only add content which you are almost certain is correct. If you see any info you know it to be false, please remove it with a short description as to why (use the "short description of changes" box for this). Tags cannot contain spaces: each word is considered a new tag. That's why it's best to remove spaces from words you want as tag: gameboy instead of Game Boy for example. 'nostory' hides the Background tab. This is for games which have no story to speak off and, as a result, don't need this tab. Examples: Pac Man, Tetris, etc. 'noquotes' hides the Quotes tab. Many games have no dialogue or not enough to have memorable quotes. 'nofans' hides the Fansite tab. Using standard tags for publishers and developers is a lot harder due to the huge range of names so if you want to add a game by a certain developer or publisher, have a quick search for that developer or publisher and see if other games made by them have already been added. If you find any, simply copy the tag this page or pages use for that developer or publisher. If you find different tags, please edit them so they're the same for all pages. The system won't properly work if one person uses westwoodstudios and another westwood as tag for Westwood Studios.